Hathrasil is a Breton citizen who lives in Markarth. 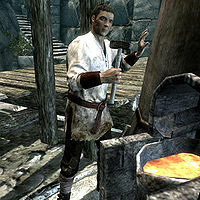 He spends most of the day working at the silver smelter alongside Omluag. Like many other workers, he sleeps in the Warrens at night. He wears a set of miner's clothes and a pair of boots. He is equipped with an iron dagger and carries a copy of the key to Omluag's room, as well as some lower-class items and gold. He lives a simple life, starting his day at 8am, and heading to the smelter to begin his work. At 7pm, after working for eleven hours, he heads to the Silver-Blood Inn to drink for three hours. He then heads down to his room in the Warrens and hangs out there until his bedtime at midnight. He is a man of few words, as can be seeing in his brief greeting while he's at the smelter, saying, "They don't like us talking to people when we work. ", "Got metal to shape." and "Busy with the smelter." When he's at the Silver-Blood Inn, he'll have a similar demeanor, saying, "Just here to drink." If asked who runs the smelter, he'll say, "Mulush. Big Orc fella. Can't miss him." During The Forsworn Conspiracy, you can ask him if he knew Weylin, to which he'll reply, "Really should talk to Mulush if you have a problem with one of the workers." You can also ask if he knows anything about the Forsworn, to which he'll say, "Don't get involved in that nonsense. Just want to work." After you have escaped from Cidhna Mine, he will be amazed and often remark, "You escaped Cidhna Mine? With Madanach? Everyone in the Warrens has been praising your name." and "What was it like? Cidhna Mine? We've all been talking about your escape. And being pardoned after. Amazing." Omluag: "First war, and now dragons. Everywhere they go, the Nords bring nothing but ruin." Hathrasil: "Ain't nothing for it. They're still in charge." Omluag: "Divines, I'm tired. This is too much work." Hathrasil: "Just keep at it, or Mulush will beat you." Hathrasil: "Careful of the molten metal. That gets on you, kiss your fingers goodbye." Omluag: "I know what I'm doing. Stop telling me." Hathrasil: "Surprised to see you working. Mulush almost broke your arm yesterday." Omluag: "Does it look like I can afford losing a day's wage? That damn Orc isn't getting the best of me." Omluag: "Another foul day at the smelter." Omluag: "'Mmmhmm'? I've been working with you for over 10 years, and all you have to say is 'mmmhmm'?" Omluag: "Sometimes I think we deserve these miserable lives of ours." This page was last modified on 18 September 2013, at 22:17.